That’s what Jennifer and Brian Bourn have done with their agency, Bourn Creative. They purposefully keep the operation small, and yet have set things up for both maximum profitability and vacation time. Marketing: Discover how a combination of content and community brought the Bourns a steady stream of clients, which in turn has led to valuable referrals. Pricing: It’s easy advice to give — charge more. But as you likely know, it’s not really that simple. You’ll hear the criteria and circumstances that made it clear it was time to raise rates. Onboarding: When the level of new business threatened to overwhelm the small agency, Jennifer took a purposeful break to document a complete onboarding and client management process that has the workflow humming and the clients happy. Listen in to get your business off to a fantastic start in 2017! Jennifer Bourn: I am Jennifer Bourn. I am partner and designer at full service design and development agency Bourn Creative, owner and blogger at Inspired Imperfection, and after 11 years of freelancing, business ownership, and working from home, I am unemployable. Brian Clark: Attracting and working with clients can be challenging. Implement the right practices and processes, though, and you can design a stellar small business and lifestyle. That’s what Jennifer and Brian Bourn have done with their agency, Bourn Creative. They purposefully keep the operation small, and yet have set things up for both maximum profitability and vacation time. 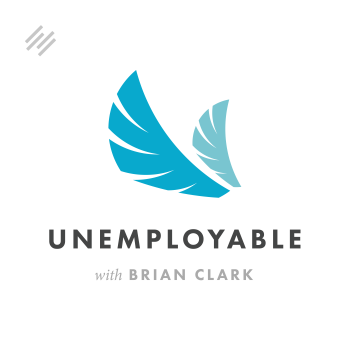 I’m Brian Clark, and this is Unemployable. If you have a freelance business or consulting practice, you’re not going to want to miss this episode of the show, which is brought to you by the all-new FreshBooks, easy accounting software for freelancers and small businesses. Sign up for an unrestricted 30-day free trial exclusively for listeners of the show by heading over to FreshBooks.com/Unemployable, and entering “Unemployable” in the “How Did You Hear About Us?” section. Get ready to hear from Jennifer how the Bourns have optimized the business in the following ways: Marketing. Discover how a combination of content and community brought the Bourns a steady stream of clients, which in turn has led to valuable referrals. Pricing. It’s easy advice to give: charge more. But as you likely know, it’s not really that simple. You’ll hear the criteria and circumstances that made it clear it was time to raise rates. Onboarding. When the level of new business threatened to overwhelm the small agency, Jennifer took a purposeful break to document a complete onboarding and client management process that has the workflow humming and the clients happy. Listen in to get your business off to a fantastic start in 2017. Jennifer, thanks so much for being here. Jennifer Bourn: Thanks for having me. Brian Clark: You are another of the people that I recently got to spend some time with down in Cabo thanks to Mr. Lema. That was a nice time. You seemed to have fun. Jennifer Bourn: It was great. I love the format of getting together and talking business in the morning and kind of having the afternoon to let things stew or further some conversations and then coming all back together in the evening. I love the format of that event. Brian Clark: Yeah, it was good for me, because if you made me go all day I’d be too burnt out, as the introvert that I am, to go out for the evening, but it was perfect. You did the morning, and then you went and did your own thing for a little bit, and then reconvened. Brian Clark: Yeah. That was awesome. All right, so we’re going to talk about a lot of great things today that’ll help out people who serve clients in various ways, whether they are a designer such as yourself, developers, writers, what have you. There’s several things that I constantly hear and observe that you guys do really well, and I want to talk about those things, because, obviously, those are the things that will help people out. First of all, elaborate a little bit on everything that Bourn Creative does. By the way, I just now got the double meaning of Bourn Creative. Just sometimes things go, “Woo,” right over my head. But yeah, talk about the scope of the business as it is today. Jennifer Bourn: We are a full service design agency, so we offer design services from brand development and print design, direct mail, event materials, programs, workbooks, all kinds of things like that. Then on the development side we are a custom website shop, so we specialize in WordPress, we build everything on the Genesis Framework, but everything we build are complex publishing sites. They’re all one-off. Yeah, that pretty much wraps it all up. Brian Clark: People are going to think I’m biased because everyone I have on this show in WordPress designs for Genesis. It’s just a coincidence, people. Are you buying that? So he started teaching himself, and the community that surrounds Genesis was so helpful and so active on Twitter at the time, and there were so many articles and tutorials and there was so much more support around that code base than WordPress in general back in, gosh, 2009, ’10, ’08, 2008? I don’t know. It was a long time ago. There was so much more support there for him as he was learning, that it was just one of those things that he learned WordPress through also learning the Genesis Framework inside and out. Brian Clark: Yeah, that community is so great. They self-organize, they self-support each other. I mean, we’re there basically just to hopefully make things better, but it really is a vibrant community. That’s kind of a proud thing for us, especially for Gardner. Brian Clark: For those of you who don’t realize, Brian Gardner is a partner in Rainmaker Digital, and he founded StudioPress which created the Genesis Framework. So there you have it. Okay, so today Bourn Creative is a thriving business. What was the path to here? What did you do in your life prior to starting the agency? Jennifer Bourn: I have been nothing but a designer. I started doing design in high school. I started working for an ad agency and started doing design work on the side when I was in college, switched my major from electrical engineering to graphic design. I graduated with six internships under my belt, took a job at a publishing company for a year, two years, at a PR firm for a year, and then started my own business when I had little babies so I could be at home with the kiddos. So I’ve done the same thing my entire career since ’97. Brian Clark: Isn’t that interesting, though? Because so many times people are like, “Okay, I’m going to have children. I want to be able to spend more time with them,” and yet I would guess that things are much more lucrative these days than when you worked for a publishing company or a PR firm. Brian Clark: It’s interesting. It’s more common than I think people realize. Brian Clark: Even with myself. I never thought of myself as an entrepreneur. I just couldn’t stand my job, really, and I just went out and tried to make it. But yeah, so many other times it’s a matter of circumstance and then it becomes, it defines you. Brian Clark: And that’s cool. Brian Clark: So I do want to talk about onboarding and things like that, because that’s so critical. When I had client businesses, I failed at all of that. I was really good at marketing and not so good at making things livable within the business, but we’ll get to that. Let’s start with marketing because I know you’re a prolific writer on your own site, but also in many other places. How important was content marketing to growing the agency? Jennifer Bourn: It was the primary source of growth for us for several years. I hate marketing. I hate talking about myself and getting out there and … I hate feeling pushy. It just was never any of one of those things. The sales aspect of kind of pushing sales never felt good to me, but I could create content. I could create value. I could write articles and help other people and answer questions, and that felt good. That felt easy. That was something that didn’t take a lot of effort on my end because I enjoy writing. That was a way for me to market myself and build a reputation for myself while kind of avoiding the sales-y aspect of things. And by constantly and consistently publishing content, articles … Back then it was teleseminars. Teleseminar, telesummits, online events, things like that. I did a lot of that when I was early in my business to gain visibility, to get my name out there, to share that expertise so people would know who I am and know what I’m great at and my perspective on things. When you pair that with then being present in social media and answering every single time someone had a question on anything related to what we do, I answered the question. I gave them the solution, I gave them the answer with zero expectation that I would ever be hired, and what started to happen is the phone started to ring, our intake form started to get filled out all the time, and people who were getting those answers, maybe they couldn’t hire us, but they knew people who could, and we started seeing referrals skyrocket. Brian Clark: That’s awesome, and yes, amen to … I mean, when I started using content to attract clients back in the late ’90s, primarily it was because there is no way in hell I’m cold-calling anyone, knocking on someone’s door, all this stuff. Then by the time we crossed into the 21st century and I realize what I’m doing is more effective, for example, in the real estate industry where I went into next, than what the traditionalists were doing … And they were doing these horrible stuff that I couldn’t do, and yet I was eating their lunch with content. Jennifer Bourn: Yeah. Well, that’s the thing. As a designer, you graduate and they’re like, “Put together a portfolio and go pound the pavement.” I’m like, “I never want to do that.” I never want to have to do the dog and pony show and be put up against three other people to be judged to see if I’m worthy. I never want to do that. And with content marketing you can kind of just skip that part. Brian Clark: Yeah. But something else you said is important, and a lot of people get hung up on this. It kills me when, especially licensed professions like attorneys or whatever, who won’t just give the answer away because they’re like, “Well, why should I tell them anything? They’re not paying me.” Yet that’s the best kind of marketing you can do. You can’t expect anything, but you end up getting back more than you would’ve expected in the first place. Jennifer Bourn: Definitely. Well, and I think it’s important that most people don’t realize 80% of the people you give the answer to, they’re not going to do anything with it anyway, but they’ll remember that they gave you that answer. Eventually when they realize they haven’t done anything, they’ll call you. Or when they have a friend who needs something, they’ll refer you. Or when somebody else has a question, they’ll point those people in your direction. You can’t underestimate the impact of just solving somebody’s problem. Brian Clark: Yep, absolutely. Another, I think, underappreciated aspect of marketing is positioning yourself within the marketplace, and a big way to do that is through pricing. Brian Clark: You guys are not cheap, and I suspect that was a conscious decision and yet it is so hard for people … I mean, so many designers, so many freelancers are on a race to the bottom thinking the way to succeed is to charge less, and yet there’s all this advice out there that says, “No, it’s probably the opposite.” I guess it’s a courage thing, right? I struggle with pricing. It’s just one of those things. Were you always positioned that way, or is it something you learned over time, to put the value on your work that you want represented in the marketplace? Jennifer Bourn: It is not something that we’ve always done. I did cheap projects for a really, really long time. I worked for super low rates. Man, my clients … I cringe at what I used to charge. But, I think it’s something that you can’t just jump into a market and say, “I’m going to charge high rates,” when you don’t have anything to back it up. Raising your rates comes over time. I think it’s something that you get with experience. I think it’s something that you get the ability to do when you learn how to add value to projects. At first, when we first started doing WordPress … My first WordPress site was like $600. Brian Clark: I totally strong-armed Chris Pearson into giving me a $2,000 design. Jennifer Bourn: Nice. But, I mean, it was one of those things that it was brand new, it was something I was learning, I didn’t know any better, I hadn’t been in business that long. When I jumped to $1,500 that was a really big deal and it felt scary, and when we jumped to $3,000 for a site that felt really scary. And we jumped to five and then 10 and then on and on and where we’re at now. But the thing was, it wasn’t just “Oh, I think I’ll raise my rates.” It was we kept improving our own skills. We constantly are looking at “How can I get better? How can I build better projects? How can I build more flexibility into it? How can I give the client a better end product, a better experience, more training? How can I make it easier for them?” So we’re constantly learning and getting better. What needs to happen as you’re constantly getting better, our projects started getting more complicated. And as Brian became a better developer, my design started becoming more complicated because I knew what he could build. And if he couldn’t build it I’d say, “So you’re telling me you can’t?” Then of course he would be like, “No, okay, I can. I’ll figure it out,” and he always figured it out. But I think as you get better, your work gets better, and we found our work getting more complicated. But you need to look back and say, “Well, what justifies that? What am I giving a client that’s going to make that worth it to them, that’s going to add that value, that’s going to make them be a raving fan even at that higher price? What’s going to make that worth it for them?” We operate from a phrase of “firm, fair, and friendly.” We are always fair with our pricing, we are firm with our contracts, and we’re friendly with our clients. We enjoy working together. And as long as we stick with those things and we continue to adjust, as we continue to grow and improve and learn new things and get better and grow our projects, then it’s a win for us and it’s a win for our clients. Brian Clark: Yeah, absolutely, and it becomes self-perpetuating, especially as your referral business started to grow. You’re attracting a different type of client, which in turn attracts more of those types of clients. It’s almost ingrained that, “Well, I guess the guy who sent me over here paid that much. Must be a fair price, right?” And it is. That’s what I love … I talk about where perceived value matches actual value. Jennifer Bourn: Definitely, I agree with you there. Brian Clark: Okay, so clients … Well, let’s say prospects, prospective clients, they knock on the door the initial time. It could be in email form, phone call, social media ping, whatever the case may be. Walk us through, since Tony has bragged about your onboarding so much, tell me how you handle this. The solution for that was creating systems and processes, and then automating those systems and processes, so nothing’s falling through the cracks. Our clients are getting better service, and we’re having time freed up to actually do the things that matter instead of being bombarded with mundane kind of admin tasks. So it’s not just a matter of creating the systems and processes, but finding ways to automate them and make them run so it frees up your time. Brian Clark: Yeah, let me ask you this before we get into it because that was my exact problem. Brian Clark: Again, I was really good at marketing, attracted more clients than I expected at any given time, and then just worked my tail off because I didn’t want to disappoint anyone. So I wasn’t going to let it slip through the cracks. I was the one who suffered more than anything. Jennifer Bourn: Right there with you. Jennifer Bourn: When you have enough time. Brian Clark: Exactly. I mean, it’s such easy advice to give, but it’s tough. I mean for me, life intervened and I ended up leaving the business and then I started Copyblogger and that was a whole different thing. I learned my lesson. That’s why Tony was my first partner. Okay, so you’re in the middle of it. How did you even take the step back to implement the systems and processes in the first place? Unemployable is brought to you by the all-new FreshBooks, easy accounting software for freelancers and small businesses. Sign up for an unrestricted 30-day free trial exclusively for listeners of the show by heading over to FreshBooks.com/Unemployable and entering “Unemployable” in the “How Did You Hear About Us?” section. But first, let’s talk about getting paid. Typical day. You’re racing against the clock to wrap up three projects, prepping for a client meeting later in the afternoon, and knowing you need to get those invoices out and some bookkeeping done. Fine, right? But you’re the one who’s got to get paid when you’re an unemployable type, right? That’s why our friends at FreshBooks have created accounting software that matches up perfectly with the way your business works, unlike just about any other traditional accounting solution out there. Even better, FreshBooks has been redesigned from the ground up and custom built to even better match the way you work. Get ready for the simplest way to be more productive, organized, and most importantly, get paid fast. The all new FreshBooks is easy to use, and it’s packed full of powerful features. Create and send professional-looking invoices in less than 30 seconds. Set up online payments with just a couple of clicks and get paid up to four days faster. See when your client has seen your invoice and put an end to the guessing games. FreshBooks is offering a 30-day, unrestricted free trial to listeners of the show. To claim it, just go to FreshBooks.com/Unemployable and enter “Unemployable” in the “How Did You Hear About Us” section. Jennifer Bourn: The catalyst for us … There were really two core catalysts. In 2009, I was so overwhelmed, I knew I needed help, and I didn’t know if I needed to hire somebody, if I needed a virtual assistant, if I needed … I didn’t know what I needed, but I knew I needed help, and it was probably going to come in the form of another person. I saw an ad for Infusionsoft at the time that said, “Replace an employee.” And I thought, “Wait, I could buy this and not hire somebody? What?” I flew to LA and I went to an event and I invested and I bought it. So we used them for years. We don’t anymore, but we used them for years to automate. We had this software that we were using for email marketing and our content marketing and things like that, but we weren’t really leveraging it as much as I thought we should. Then I was at an event a couple years later and I sat down at a dinner with some really key people that I was building some relationships with, and one of them said, “I really wanted you to do my website, but I reached out about working together and I never got a response.” And I thought, “Oh my gosh, I remember that.” And I was so busy working in my business serving the clients that I had that was one of the things that slipped through the cracks. I got home and I’m like, “Okay, something has to change. We have to fix this problem. It’s going to make us look bad if we don’t. We’re at that cusp where it hasn’t done too much damage yet, but it could do a lot of damage if we don’t fix it.” So we take two weeks off at Christmas every year, completely off, close the business, we’re out. So we spent those two weeks that year, at the end of 2010, and we crafted the kind of experience and documented and wrote down the kind of experience we wanted our clients to have from the moment they fill out that project inquiry form or they reach out to us, to how they’re going to interact with us in the sales process, and once they sign a contract for a website, how their experience, their initial conversations of how that kickoff is going to go, because that’s going to set the tone for their entire experience with us. We sat down and kind of mapped out how we wanted that all to work, and looked at what content needed to be created to give them the training and the information and everything that they needed, and made a big outline. And over the next few months I just started creating all of that content, and as I would create it, I would publish it on the blog, because hello, repurposing. I needed blog content, I was writing this content anyway. So I started publishing it all on the blog as I was going, and then once we had the whole system kind of written and done, it was time for testing. Brian Clark: Yeah. That’s amazing. I love that process, and people don’t realize that the documentation is the first step. You got to take that step back and actually understand what the process is. Now, I think it’s been a year and half or so, I talked to Paul Jarvis, who is a freelancer who automated his onboarding to such a degree that what used to begin with a phone call with the prospective client, that was like six steps down the line where they had to review … It was all content and automation technology that, in essence, kind of pre-qualified while it also gave them next steps and, “Here’s how it’s going to work” and all of that. Is that similar to what you do? And how do you choose what is appropriate for automation versus a human novel contact, if you will? Jennifer Bourn: Well, I think the first thing to look at is while our processes are really similar, people get skeptical when you start talking about automation because they think “Oh, you’re taking out your contact with your clients. You’re taking out the thing that is building your relationship.” And that’s not true. It’s not meant to replace or eliminate your interactions with your clients, but to supplement and enhance them. So instead of you having to go back and forth with them five times just to get their email address that they signed up for a Gravatar with, that’s all handled automatically. And your time is able to be spent with them working on strategy or things that really matter, the beginning of projects, instead of being on the phone gathering all kinds of admin data, and making sure you have the right contact information, and all of those things. All of the minor stuff, all of the admin stuff, all of the things that you need them to do and get done can all happen automatically. Then, when you’re on the phone with them, you’re not spending your valuable time doing that. You’re spending the time on the phone with your client working on the things that are going to help them the most, and move the project forward in the most meaningful way. Brian Clark: Yeah. It’s interesting to me. On one hand we have the concept of productized consulting, where the scope is limited, the fee is set or set among various levels on one end. And on the other end, and it seems to me the type of work that you and Brian do, which is more sophisticated … Scope creep, how do you keep that from really just derailing this otherwise elegant onboarding process? Jennifer Bourn: As I told you earlier, our business has grown over time, right? It’s grown as we have evolved. When we were doing primarily all flat-rate work and we were doing sites of $10,000 or less, flat-rate projects with set scopes of work, scope of work wasn’t as big of an issue, and it wouldn’t ever really derail any of the automated systems, because when those were coming in we’re in between systems. Our website automation, kind of client care process, our onboarding process and everything, starts with wandering prospecting. Then the core onboarding process starts when we get the first payment. When their first payment triggers, it kicked off. Another sequence would kick off at the start of design. Another sequence would kick off at the start of development. And another sequence would kick off when the website went live and launched. We manually triggered those when the client got to certain parts of the project. As we’ve moved up market, we do much fewer projects, a lot less projects that are flat-rate. We still do them, but just less, and we do more that are ongoing work. We use the exact same process and content, but at that higher level it’s not automated. So instead of sending an email we might pick up the phone. We have the same content, the same guide that we’re following, but it’s more personal, it’s higher touch, and it’s more active project management. Brian Clark: So is it fair to say that really, and again I get that it’s not automated, but it’s still process-driven, that it goes beyond what I think of as onboarding and into client relationships and management? Jennifer Bourn: Yeah. Well, and I think what happens is, and other designers that are listening to this will relate … When you’re in the design phase and you’re working on the design, you might not need to talk to your client for a week. But, the last thing you want them to do is email you and say, “I haven’t heard from you for a week. What’s going on with my project?” That’s a terrible experience. But, at the time, we were doing a lot more projects than we do now, we were juggling a lot more clients, and we needed a way for them to still feel like they were engaged with us, still feel like they were working, the forward process was getting done on their project, that they were getting things done, that things were happening, even though we weren’t communicating with them. Brian Clark: It’s so proactively smart because I think it’s so easy to slip into the mindset that “Well, if there’s nothing to talk about then there’s no reason to contact them,” and that’s highly logical and highly wrong, because the client is coming at it from … Whether they recognize it or not, it’s an emotional standpoint. All you’re doing is placating them nicely. The interesting thing is your experience over there doing the work is exactly the same as mine might be not talking to the client, and yet you’ve got happy clients and I may have one who’s upset at that point. Jennifer Bourn: Definitely. That’s kind of one of the things that when we were creating these processes back in early 2011, why we didn’t stop at onboarding and we created the next process for design and the next one for development, and we even had one that started … We even have one that starts when the site goes live, that’s “Okay, now you have a live site. What do you do with it? How do you use it? How do you leverage it? What do you need to know when you post new content? What about sharing on social media?” Things like that. So it’s looking at not just how do you create a system for onboarding to the set the tone for the project and to set expectations for what it’s going to be like, but how do you continue that experience all the way through the project so that they’re just as excited as they were when they first paid you, as they were with the last payment and you’re all done with your project? Brian Clark: Yeah, Tony was right. This is good stuff. Okay. Give us one more thing that Bourn Creative does that you think is critical to the success of your business, but may not be common practice. And a ridiculous amount of work came from that, and then came from referrals from that. When the kids got a little bit older and business got even busier and I stopped traveling as much, I was able to create the same experience by now, instead of investing in giant conferences, I started investing in large online communities or Mastermind programs. So there are a lot of business coaches and Internet marketers that, like the Authority program that you guys run, you can join that for a nominal fee and become part of a community full of people who could potentially be your clients. Now, as a designer, a lot of people need what I do so that is my luck there. But, I would join these communities and never, ever, ever pitch anything to do with myself. But, I would check in two or three times a day to look at what questions are people asking and if they’re asking anything about branding, about websites, about online marketing, about content marketing, about blogging. If I could answer their question, I would answer their question. And eventually it was “Jennifer Bourn, I need an answer to this question.” “I have an answer to this,” and someone else would tag me because they knew I would probably have the answer. By the end of the one year program or the two year program or the simonth program, by the end of that, all of the people in that entire community knew who I was and knew I was the go-to person if they ever needed anything to do with this topic. And some of them turned into clients while I was in those programs, and then some of them became clients two, three, or four years after those programs. Brian Clark: Yep, it comes down to knowing who your ideal customer is and unfortunately you’re right. That’s not very common. It should be. I mean, that’s like rule number one. Brian Clark: But I know you contribute a lot to the WordPress community as a form of giving back. When we initially got into the premium WordPress market with themes and software and whatnot, I understood that my ideal customer was a businessperson, not necessarily the more sophisticated people in the WordPress community, and that was like an epiphany to people. So you give back to the community, but you understand that that’s a different animal than where you might find the bulk of your business. Jennifer Bourn: Yeah, Brian and I co-organized the Sacramento WordPress Meetup. I’m the Lead Organizer for WordCamp Sacramento, and we attend and speak at WordCamps throughout the year, and we do so with zero expectation of getting any business. When we were getting started in WordPress, when Brian was learning development, the community helped us and helped us grow and learn, and we kind of look at it as now it’s our way to pay that forward. And if we do a good job then those people will eventually pay that forward. It’s also the long game. I think those things where you look at potential partners, potential subcontractors we’ve hired out of the community. We’ve gotten job offers out of the community. We haven’t taken them, but we’ve gotten job offers. Getting involved in the community has been a branding initiative for us, to build our brand and to establish our expertise in a certain area. It’s helped tremendously, but it’s not where we go for clients. Brian Clark: That’s awesome that you give back so much, though, and that’s, I think, evident to everyone. Jennifer, tell everyone where they can find you on the web, on Twitter, Facebook, whatever else you think is relevant. Jennifer Bourn: You can find me at Bourn Creative. It’s B-O-U-R-N Creative. There’s no “e” like the movies. You can find me at my personal blog with recipes and travel at Inspired Imperfection, and I am @jenniferbourn on Twitter, Facebook, LinkedIn, all the places. Brian Clark: That’s right, I forgot you just launched a new site. What’s it called again? Brian Clark: And this is about cooking? Jennifer Bourn: I was looking for a personal outlet to share things that weren’t agency related, and I kind of came up with this idea of living inspired and embracing my imperfection, and just kind of getting out there. It’s where we share our recipes and all our kind of waffle experiments and our family adventures and hikes and travels and places we go and some of my thoughts on trying to juggle work-life balance, and some of the places we have succeeded and some of the places we’ve failed. Brian Clark: Yeah, that’s very cool, the personal projects. My personal project, Further, I talk about the need to do personal projects, so it’s kind of self-referential, but it is. It’s important to express yourself outside of a professional capacity without really, again, without looking or having an expectation of return, but sometimes it may surprise you. You never know. So good luck with that. Brian Clark: All right, everyone, thanks for tuning in. I don’t know about you, but this is some good stuff, especially if you’re struggling with the management of the client relationship, getting them involved, keeping them happy without them driving you insane. Yes, I can be somewhat anti-client, but really, that was my own fault. I recognize that now. And now that’s why Tony takes care of all that kind of stuff for me. Anyway, hope you learned some good stuff, and don’t forget to keep going.